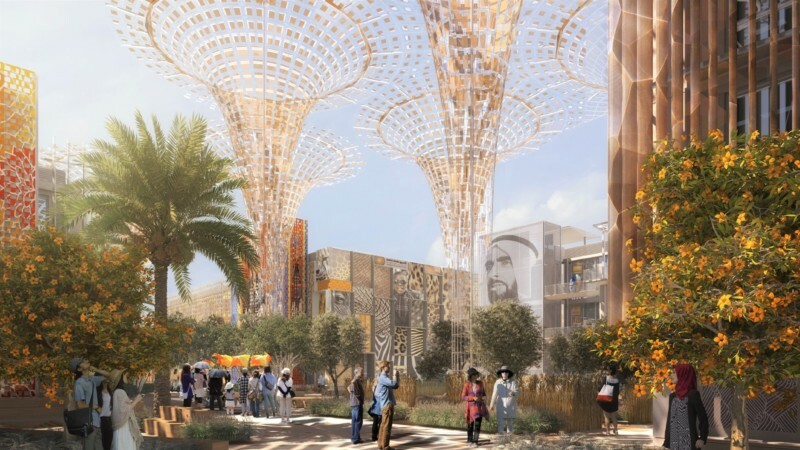 According to organizers of Dubai Expo 2020 which is scheduled to run 20 October 2020 – 10 April 2021, 170 countries have committed to participate; all major design elements of the site are completed, and construction of the buildings is underway for the three theme areas – Sustainability, Mobility and Opportunity. UAE-based companies involved in the construction effort include: Al-Futtaim Carillion, Khansaheb, Besix, Arabtec, Tristar Engineering and Al Naboodah Construction. Dubai’s Road and Transport Authority (RTA) continues to make progress on the 15 km, 7-station Route 2020 Dubai Metro Red Line to the Expo site. Some 50 per cent of the main tunneling is complete and the new metro cars will arrive in July 2018. The line is set to be completed in July 2019. Photo at top: Rendering of Thematic District design for Dubai Expo 2020, provided courtesy the Expo. The United States issued an RFP for the design, construction and operation of a USA Pavilion at Dubai, that will focus on the Mobility theme. Estimated cost is $50-60 million, all of which the winning bidder will have to raise from the private sector. Proposals are due April 17, 2018. The U.S. Department of State’s Expo Unit, in collaboration with the U.S.-U.A.E. Business Council, and local partners in New York, Houston, Detroit, San Francisco, and Palo Alto, has organized a series of info sessions to raise awareness and inform prospective bidders. Argentina won its bid to host Expo 2023 in Buenos Aires with the theme of “Science, Innovation, Art and Creativity for Human Development. Creative Industries in Digital Convergence.” Dates of the three-month event are 15 January – 15 April 2023. –Japan would host May 3-November 3, 2025 with the theme, “Designing Future Society for Our Lives.” It would be held in Osaka, which has hosted a world expo before, in 1970. –The Russian Federation submitted a bid with the theme, “Changing the World: Inclusive Innovations – for Our Kids and Future Generations” to take place in Ekaterinburg. –Azerbaijan submitted a bid with the theme, “Human Capital,” to be hosted in Baku. BIE representatives have completed an Enquiry Mission to Japan visiting Tokyo and the candidate city Osaka. They met with Prime Minister Shinzo Abe, the Minister of Economy, Trade and Industry, Hiroshige Seko, and the Parliamentary Vice-Minister for Foreign Affairs, Mitsunari Okamoto, as well as other senior political figures. In Osaka they were received by Ichiro Matsui, Governor of Osaka Prefecture, and by Hirofumi Yoshimura, Mayor of Osaka City. They also held meetings with business and civil society supporters of the Expo project. They received presentations of the bid project and visited Yumeshima Island, the location of the proposed Expo site. On April 2-4, 2018 the Enquiry Mission will travel to Russia to evaluate the Ekaterinburg Expo 2025 bid, and on April 17-19, to visit Azerbaijan to assess Baku’s bid to host Expo 2025. The task of the Enquiry Missions is to assess the feasibility and viability of each Expo project. The findings will be discussed by the BIE Executive Committee in May 2018, which then will draw up a recommendation to the General Assembly based on each project’s viability and conformity to BIE regulations. A vote by the 170 member countries of the BIE to select a winner will take place in November of this year. The 2019 Horticultural Expo in Beijing will be held in Yanqing District in Beijing from 29 April – 7 October. The theme is “Live Green, Live Better.” Expo 2019 comes under the auspices of both the BIE and the Association of Horticultural Producers (AIPH). Attendance projection is 16 million. On January 19, 2018, the main structure of the China Pavilion was completed. The 23,000 square meter building was built by the Beijing Urban Construction Group. Interior work will now begin as well as outdoor exhibition projects and the main structures of the Expo’s hotels and auxiliary facilities.